If anyone had told me a year ago that I’d be spending four days standing in the Irish Sea in November trying to catch bass in the frost I would called them mad. But you know what, when it comes to bass, they do things a little different out here – and a lot better? Because of uncontrolled over-fishing the Irish bass stocks collapsed in the eighties and thanks to the great work of the late Des Brennan of the old Irish Central Fisheries Board the argument was won to make bass a recreational only species from 1990. There is a strict two fish bag limit and a higher minimum landing size which is likely to be raised shortly to 50cms – some 14cms above that of the UK and well above the optimum spawning size. And what a fishery they have out here as a result having the sense to learn from previous mistakes and introduce sensible conservation measures. 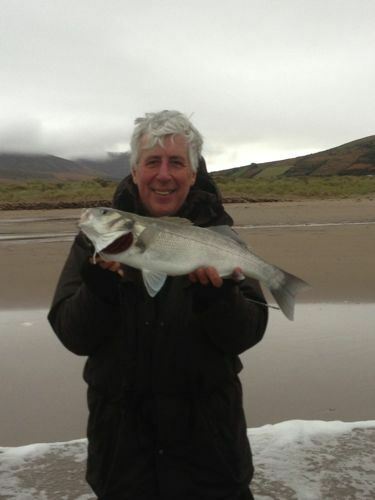 Anglers now come to Ireland from all over Europe to experience first class bass fishing. And on the West coast it’s even possible to still be catching bass on Christmas Day ! 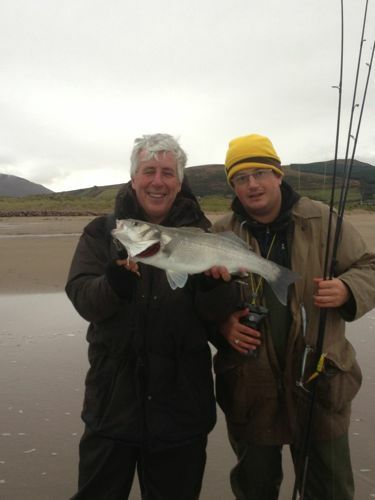 With David Mitchell and a nice Tralee Bay bass. I know my eyes are closed but I was being blinded by the glare of that hat! Marine Campaigns Manger David Mitchell and myself are over in the Emerald Isle right now meeting with the guys from Irish Bass to see what we can learn in order to put together the Angling Trust submission to the current Defra review of the English bass MLS which is currently underway. Needless to say we’ve felt obliged to do a little ‘fieldwork’ and we are pleased to report that the Irish bass are in fine fettle and appear to average about four pounds – twice the average size of their English cousins. Something to do with not removing immature bass from the fishery before they’ve had a chance to breed perhaps? We’ll keep you posted as to how we get on.